Blues are defenders. 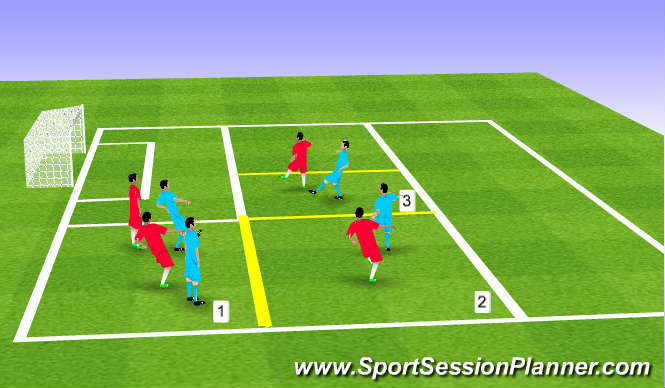 6 attackers interpass with a given number of touches playing through the pairs of defenders. Touches could = one touch to play back. Two touches recive and turn. Progression - 3 v 3. goal at each end. These must be two players with ball = one goal any given time. Offsides apply. Outcome = support and rotation. Practice starts in grid 1. whoever has the ball feeds into 2 and support can take place. The ball then can progress to grid 3 with support. Two touches in the penalty area to score. 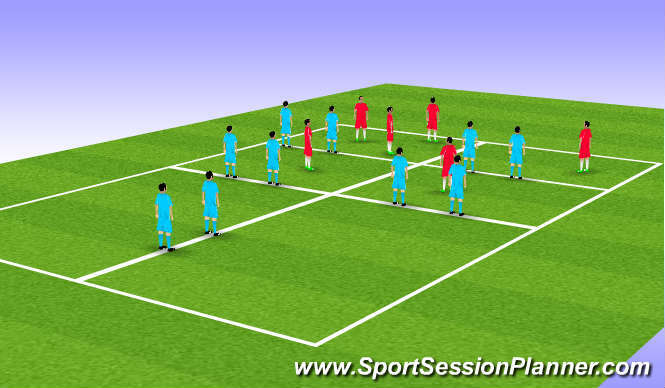 Different kinds of passing. What touch at the back, Midfield or upfront. Use of the body to screen. Space and tone in what part of the field Defence, Midfield, addack. Rotation angle and distance in 1/3. High intensity sharp short running. agility, balance, strength. The mind loves repetition, being sucessful brings confidence. Understanding what you do brings confidence. Players were very tired after the weekend games. Tried hard but only average quality.